← Rountree’s Fruit Pastilles..chewy love! I had forgotten all about these treats, until I was perusing the Vermont County Store’s candy section. They were a like the indie movie sleeper of the penny candy counter. 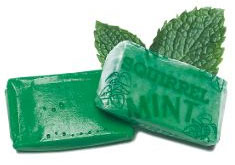 Mint and taffy combine for a great chew. They are thin enough not to remove a filling or crown, if they’re a little stale. Look for them in the penny candy section, or order a 2 lb bag!